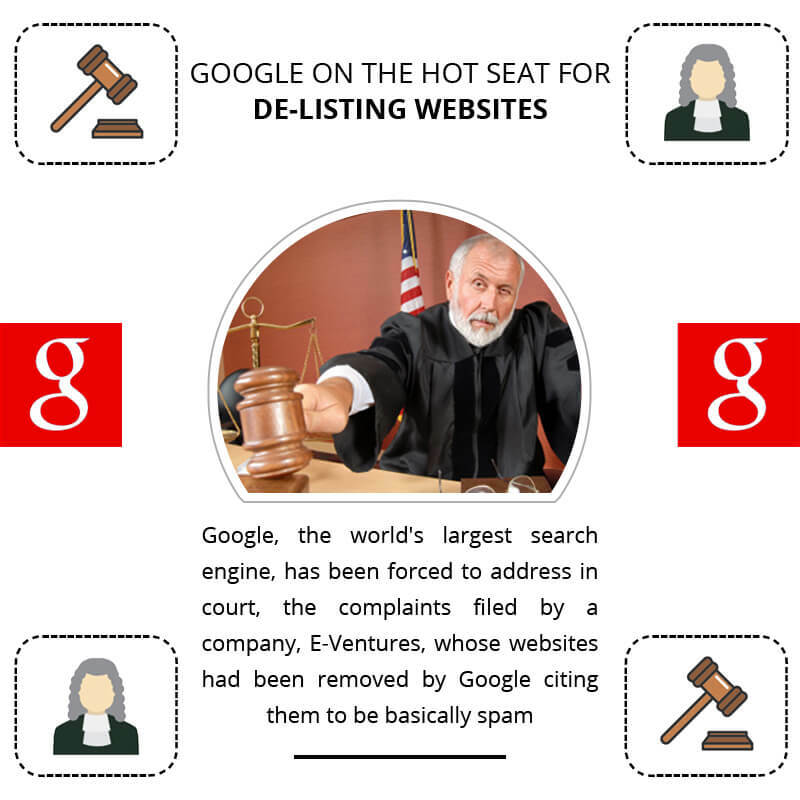 In a precedent setting case that could greatly affect SEO results, Google, the world’s largest search engine, has been forced to address in court, the complaints filed by a company, E-Ventures, whose websites had been removed by Google citing them to be basically spam. Normally, Google would have defended itself on First Amendment rights, but a federal judge saw otherwise and agreed with the plaintiffs that Google, in this situation, would have to defend its de-listing actions. Google removed the plaintiff’s 200 plus websites citing they were spam. The plaintiffs argued that Google’s decision was detrimental to their business and didn’t follow Google’s procedures as laid out in their terms of service. Prior to this case, Google could defend itself against such claims, but the federal judge saw otherwise and now a new game is on. Should the decision hold and a trial ensue, Google could be forced into a new era of legal protection for itself as well as the other search engines and directories. Google as a corporation does indeed have First Amendment rights and has used this as protection against such lawsuits and claims quite successfully until now. A lot rides on this case. Google removes millions of websites from companies each year. Should all of them seek remedy in court, it could clog the court systems and overwhelm Google’s legal resources. Google tried to get the case dismissed but the federal judge would have nothing to do with that motion but to deny it. Basically, E-Ventures stated that the policies of Google were not in step with their ‘Removal Policies’ and Google cited a federal law, 47 USC 230 (c)(2) that says in detail that websites aren’t liable for filtering of content decisions. In other words, if you run a website and people or companies submit content, you have the discretion to keep or block, or remove said content. The federal judge felt otherwise stating that the law has a requirement that said decisions had to be made in good faith. He felt that Google’s decision to remove the sites was not in good faith. Industry experts will be watching this case in Florida like a hawk. It will have unimaginable ramifications if it goes forward and the courts side with the plaintiff. It could mean that millions of other companies and individuals, could sue Google over removing their sites from Google which would definitely clog the courts to no end. It’s certain that the legal profession will analyze the judge’s decision which on face value looks more like a personal opinion decision than that of legal procedure. The judge has state in no uncertain terms that the court has determined that Google did not follow its own policies in advance. The decision on this case will fall on that evaluation and a jury will have to study up on such policies and procedures and then look at the actions of both the plaintiff and Google to determine if the judge is correct or not. This case is one of the biggest and most important to hit SEO results in years. It could literally usher in a whole new reformatting of search engines and the web. Google is one of the world’s biggest and most profitable corporations and has been effective in changing life on Earth in myriad of fashions, not too welcomed by certain political, commercial, religious, and ideological groups. If it’s determined that the decision by the judge was personal and not of an objective venue, the case might get dismissed and a whole new level of problems occur. We’ll all have to wait and see how this case affects SEO results. It’s sure to be a case of exciting proportions.